The Medical entomology video in motion design has just been translated into french! This video has been developed by the Institut de Recherche pour le Développement (IRD) and the Institut Pasteur in order to promote this discipline which is one of the five components of the MediLabSecure project. Aimed at all audiences, this educational video provides a better understanding of the central role played by medical entomology in the fight and control of vector-borne diseases. Stay tuned, new videos are coming! In the meantime, do not hesitate to share this video beyond the project within your own networks of interest. The human virology working group of the MediLabSecure project was present to the 21st « Journées Francophones de Virologie » (“Virology French Days”) that were held in Lyon, France on March 28-29. Organised by the « Société Française de Virologie » (“French Society of Virology”) and gathering more than 450 participants among others researchers, engineers, veterinarians, and professors, this meeting aimed at offering a global vision of progress in molecular and cellular, medical, veterinary or plant virology to the French speaking community. This meeting was the occasion to present a poster on the MediLabSecure project, which describes the general methodology and activities carried within the network as well as the main objectives of the second phase of MediLabSecure. Let’s meet next year for the 22nd edition of the «Journées Francophones de Virologie » that will be organized in the Institut Pasteur in Paris on April 2-3, 2020 ! 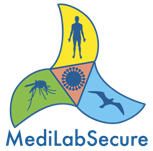 The MediLabSecure strategic document on "Integrated surveillance and risk assessment for arbovirus infections: recommendations for enhancing One Health in the Mediterranean Region" has been published. Carried out by the Public Health working group, this document aims to contribute to the strategies for the prevention and control of arbovirus infections with a One Health approach, by focusing on integrated surveillance and multisectoralrisk assessment. The integrated surveillance systems of three countries of the Network (Serbia, Georgia and Tunisia) have been described and assessed with a MediLabSecure situation analysis study (MeSA Study). The relevant results and lessons learned provided by the studies and activities implemented in four years of the MediLabSecure Project (2014-2017) have been reported and discussed in this strategic document, including recommendations for future actions. This strategic document has been recognized by the public health community as an important tool to facilitate the assessment of integrated surveillance systems and to enhance the operationalization of One Health strategies in national health policies and regional contexts. MediLabSecure was invited to participate in the joint EU-CBRN/BACAC (Biosafety Association for Central Asia and the Caucasus) 6th Annual Conference which was held in Tashkent, Uzbekistan in March 11-14, 2019. This meeting aimed at assessing and bridging the gaps in the field of biosafety in Central Asia and Caucacus. MediLabSecure presented itself in a dedicated session entitled "Regional Cooperation: Disease Surveillance". This meeting was preceded by a round table for EU-CBRN National Focal Points and representatives of partners countries in the region in which MediLaBSecure also took part as project member of the EU CBRN Centers of Excellence Initiative which addresses the mitigation of and preparedness against risks related to Chemical, Biological, Radiological and Nuclear material and agents. emerging vector-borne viruses in the Mediterranean, Back Sea & Sahel Regions"